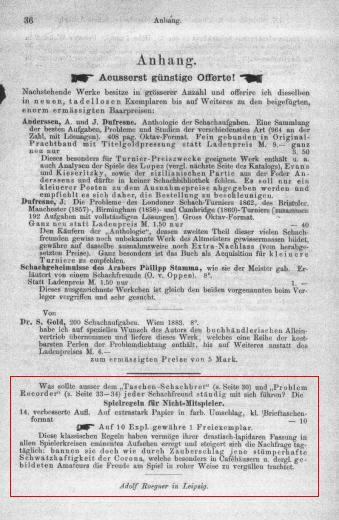 However, as discussed in C.N.s 857 and 884 (see page 121 of Chess Explorations) the German publication was no more than ‘a little pamphlet’. In C.N. 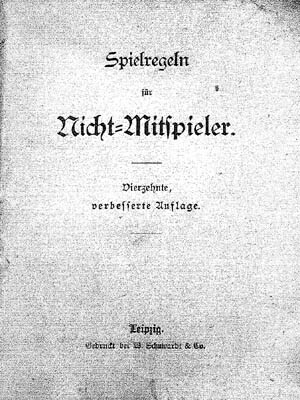 884 the ‘little pamphlet’ was identified as Regeln für Nichtmitspieler, published by Adolf Roegner of Leipzig. Does any reader possess a copy? 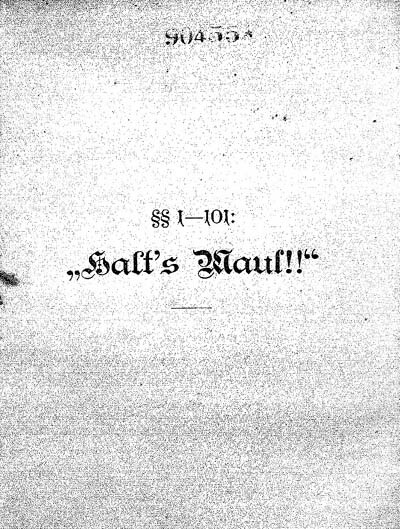 The progression from ‘a little pamphlet’ to ‘three hundred blank pages’ is notable, and we are still looking for the publication in question. In the meantime, a few leads can be set out here. 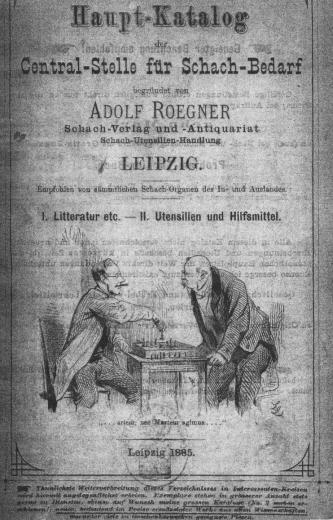 We also note that the chess library in The Hague holds (item L/N 44) a copy of Roegner’s 40-page ‘Haupt-Katalog’ dated 1885 (i.e. 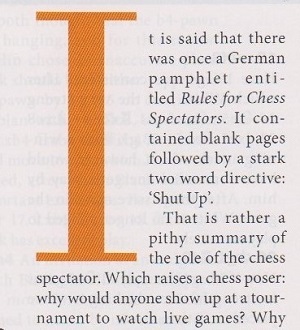 the year in which the above-quoted report appeared in the International Chess Magazine). It remains to be ascertained whether the catalogue mentions ‘Spielregeln für Nichtmitspieler’. Irving Chernev also related the episode on page 18 of Chess Review, October 1933, and on page 7 of Wonders and Curiosities of Chess (New York, 1974). The text by Reuben Fine in Lesson from My Games can be found too on page 206 of the July 1958 Chess Review. 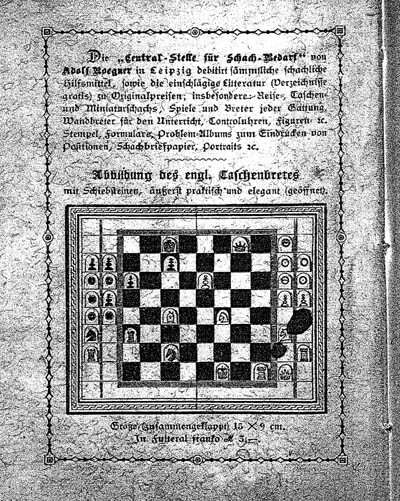 Back-cover: list of items from Roegner’s chess business and a chess diagram. 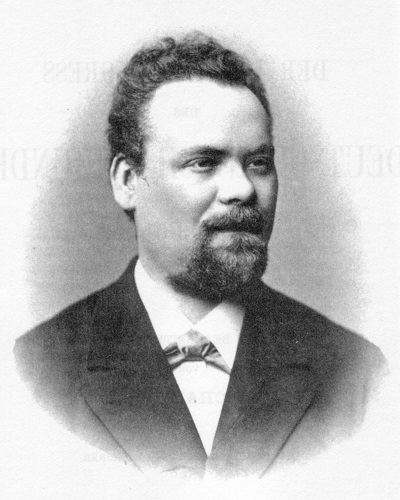 Under the title comes a reference reminiscent of Adolf Roegner’s remark in his light-hearted 1880 speech (C.N. 3356): ‘vierzehnte verbesserte Auflage’ (i.e. ‘14th revised edition’). This, then, is the work which Reuben Fine described (in Bobby Fischer’s Conquest of the World’s Chess Championship, page 79) as consisting of ‘three hundred blank pages and one other page on which was written: KEEP QUIET’. Another chess poser is why any writer would use the words ‘It is said that there was once ...’, and especially on a matter where the facts have been clearly established. Latest update: 26 March 2016.